The easiest Wake on LAN solution for the Apple TV. Rooster is an Apple TV application to turn on other devices on the local network. Rooster sends Wake-on-LAN signals to servers on the local network. It is easy to configure and provides shortcuts to local devices on the home screen. Rooster is a Wake-on-LAN app for the Apple TV. The app brings devices on the local network out of standby mode via the standard Wake-on-LAN protocol. Its primary use-case is to keep media servers — either PC/Mac file servers or dedicated network-attached storage (NAS) devices — in standby mode and turn it on only when needed. Unlike current competitors for the Apple TV, Rooster detects devices automatically via Bonjour for easy setup and also provides an option to wake-up devices from the home screen. Turn on devices on the local network via Wake-on-LAN. Automatically detects MAC address and host name via Bonjour. Top Shelf extension for quick access to devices in the network. Rooster application icon as it appears on the Apple TV device, 400×240 pixels at 72 dpi. Click to download full resolution. Rooster application icon as it appears on the App Store, 1280×768 pixels at 72 dpi. Click to download full resolution. Screenshot showing the Top Shelf extension to quickly wake-up devices from the home screen, 1920×1080 pixels at 72 dpi. Click to download full resolution. 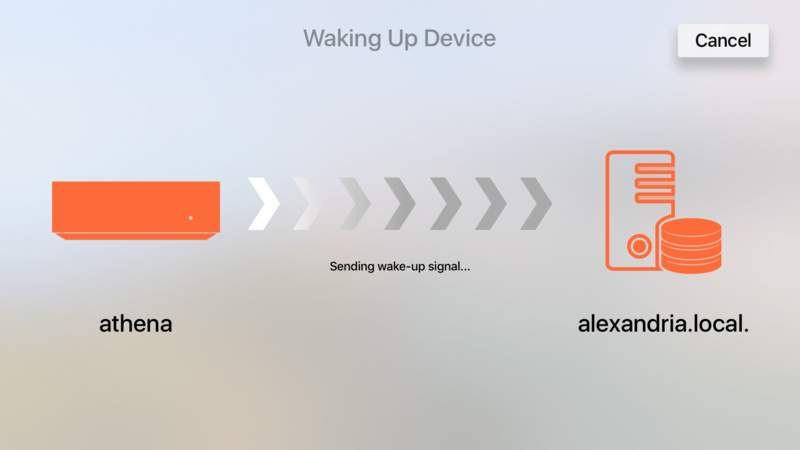 Screenshot showing the setup process to register devices to be woken up later, 1920×1080 pixels at 72 dpi. Click to download full resolution. Screenshot showing an on-going wake-on-LAN cycle, 1920×1080 pixels at 72 dpi. Click to download full resolution. Any trademarks used in this feature sheet are the property of their respective owners.